Hello everyone, still on vacation but I'm back in the Los Angeles area. I received an email from retired engineer Djajadi Susastra, who has been using Hewlett Packard calculators since 1989. Susastra obtained a BSc in Mechanical Engineering that year. He recently purchased an HP Prime calculator and has asked me to share his programs on mechanical engineering (the last three deal with business and finance), which he learned how to program the Prime from this blog. CALCULATING CROSS SECTION AREA OF CYLINDER. CALCULATING MAXIMUM BENDING MOMENT ON A CYLINDER AT YIELD. CALCULATING COLLAPSE PRESSURE ON 110 KSI YIELD PIPE (PER API 5C3). CALCULATING COLLAPSE PRESSURE ON 80 KSI YIELD PIPE (PER API 5C3). CALCULATING COLLAPSE PRESSURE ON 75KSI YIELD PIPE (PER API 5C3). CALCULATING YIELD PRESSURE (API 5 C3). CALCULATING SHEAR AREA AND BEARING AREA ON ACME THREADS. CALCULATING GROSS MARGIN (IN %) WHEN COST AND PRICE ARE KNOWN. CALCULATING PRICE WHEN COST AND GROSS MARGIN (IN %) ARE KNOWN. CALCULATING FUTURE VALUE WHEN PRESENT VALUE, INTEREST PER YEAR, AND PERIOD IN YEAR ARE KNOWN. This blog entry is property of Edward Shore. 2015. Let P be a three dimensional column vector P = [[ x ],[ y ],[ z ]]. P’ = P + T where T = [[ t1 ],[ t2 ],[ t3 ]]. This program is property of Edward Shore. 2015. 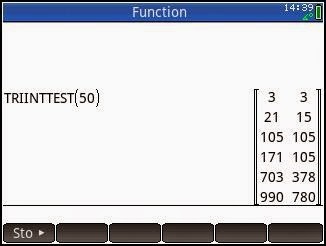 The program TRIINTEST will list pairs of triangular numbers. The argument of TRIINTEST(n), where n is upper limit of T_n to be tested. TRINUM(n): returns the nth triangular number. ITRINUM(t): test whether t is a triangular number. If t is not a triangular number, -1 is returned. The results may be surprising. In this video, Lillie Pennington, a high school student explores, uses the talking calculator in an algebra class. Pennington also describes how the calculator enables her to participate in mathematical discussion. This has made a positive impact in Pennington's academic career. I can only imagine how a sine or cosine function would sound. Purchasing one will take a significant investment. 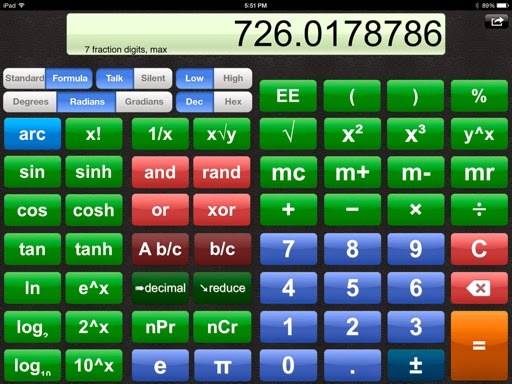 This is not the first Texas instruments calculator Orbit has worked with, as there is also a Talking TI-36X calculator. Two modes of operation: Standard and Formula. The Standard mode is a Chain mode which evaluates operations as they are entered, without regard to the order of operations. It also features two buttons for easy fraction entry: [A b/c] to enter whole number parts and converting results to mixed fraction form, and [b/c] to enter the numerator and the denominator, and also converts results to an improper fraction form. Formula mode is the algebra operating mode, where expressions are entered Expressions are calculated with the use of the equals key, and the order of operations are used. 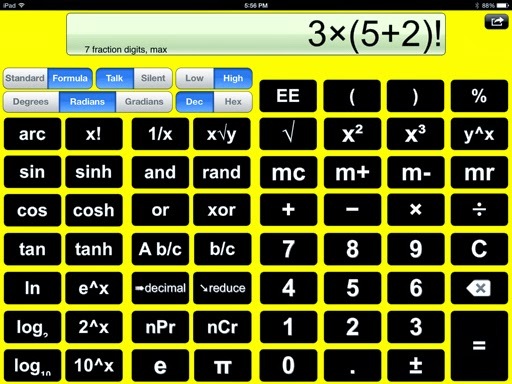 The calculator comes with the default voice, which is very pleasant voice. You can record up to four different sets of voices so you can have your voice talk back to you as you operate the calculator operate the calculator. I would suggest that you are in a quiet place if you are record keys and operations. If your iOS device has voice over turned on (which is done in the settings app), you can go over the keys and each key speaks its label. A double tap will activate the key in this mode. This app also works with certain Bluetooth Braille keyboards. These are just two of the talking calculators on the market today. 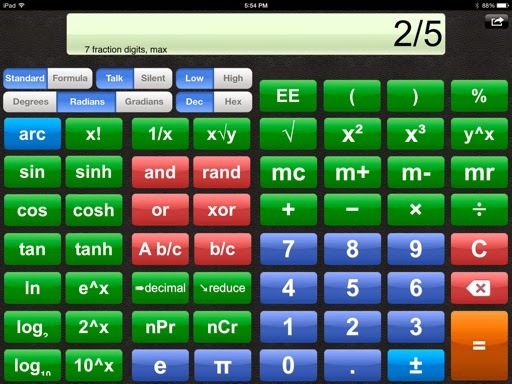 It is nice to recognize that mathematics and calculators are available to everyone. These set of programs address four common scenarios of solving spherical triangles. 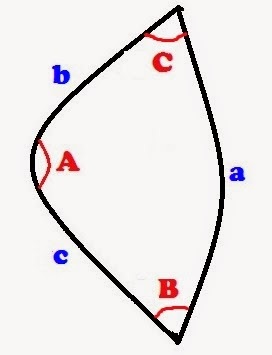 Spherical Triangle with angles A, B, C and sides a, b, c.
Referring to the diagram above: a, b, and c (lowercase) represents the sides, while A, B, and C represent (upper case) represent the angles. The programs are named symbolizing your starting point. S is used for side and A is used for angle. (If you have better program names, feel free to suggest.) All examples are given in degrees.